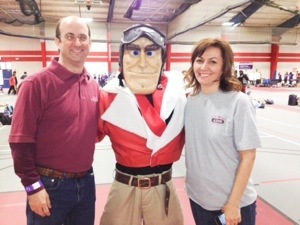 We had a fun time at the recent Relay For Life fundraising event at Lewis University in Romeoville, IL, and raised several hundred dollars for the American Cancer Society. I’ve walked in Relay for Life events at Lewis in the past in 2009, 2010 and 2011, but this is the first time my kids participated too. The event was held at the indoor track in the recreation center at Lewis. I walked a total of 66 laps at the indoor track, a number representing to me a lap for every year of my dad’s life. That amounts to just over 8 miles. My competitive son, Canyon, who frequently strives to beat his dad’s efforts, whatever they be, went around the track 102 times, which is nearly 13 miles. Of course to do that many laps over the 4 1/2 hours we participated in the event, he ran about half of those laps. Canyon was inspired by one male college-age participant who was jogging around the track when most participants merely walk. After seeing him running, Canyon joined him jogging for many laps. At times, several others also joined them jogging around the track, including at one point, my daughter and her befriend. Here is video of Canyon running with the crowd. Canyon is the small guy taking the lead. After they stopped running I spoke to the young man who began the jogging trend. I asked him if he was on the track or cross country team. He said he wasn’t, but that he had been on the track team in recent years. He was an upper classman now and was no longer on the team. I told him I was the father of the young boy who had been running with him. I told him Canyon was on the track team at his school and that he seemed to be inspired by the young man’s running. The young man said that Canyon was a good runner, but that he needed to slow down and learn how to pace himself as he was pushing the pace of the other college runners a little too fast. Imagine that! Twelve year old Canyon was pushing the college-aged track stars a little too hard! Ha! You go, Canyon! You do your best, set your own pace, and don’t slow down for anybody! About my lap 47 I surprised Canyon by following him running for a lap and video taped the lap. Once he realized I had been following him and was video taping him, he took off and left me in his dust. Here is that video (warning…it’s shaky and may make you dizzy watching it). My daughter, Tess, had her boyfriend with her for the event. I’m not sure I’m ready for this boyfriend stuff, but it was cute to see them holding hands while they walked laps. 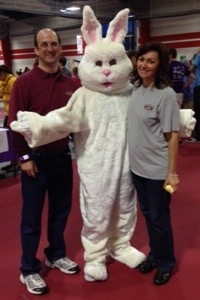 We got some nice photos at the event including ones with Bedcheck Charlie, the Lewis University Flyers mascot, and the Easter Bunny just in time for Easter. Before we left we participated in a Lumenaria ceremony and walk. It got started an hour late because of technical difficulties. It seems that no one knew how to turn off the lights in the recreation center. 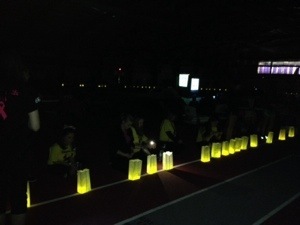 Finally the lights went out and they lit the glow sticks in the paper bags set around the inside of the track. The bags had the names of loved ones who had died from cancer. There were a lot of them. After a few words of reflection, we walked the bag-lit track for 3 songs including “Arms of the Angels” by Sarah McLachlan and a bagpipe rendition of Amazing Grace that reminded me of my Uncle Tom, another loved one who we lost to cancer this past year who I walked in loving memory of in the Relay. I also lost my godfather, Uncle Don to cancer this past year, and walked in his memory too. Thank you to those of you who sponsored me in my Relay. We raised about $400 for the American Cancer Society. Join us next year! 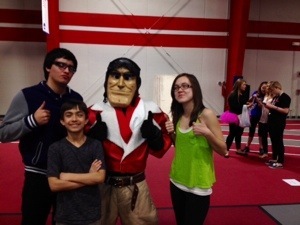 — The kids and I enjoyed the event so much we are already talking about participating in the Relay next year. If you would be interested in participating as a fellow Lewis University alumnus or family member at the Relay for Life event next year, please let me know. I would like to put a team together to improve our fundraising results and to make the event even more enjoyable, festive and meaningful for us all, and more successful for the fundraising efforts for the noble fight on cancer.